“A Light In The Attic” from Christian Faith Publishing author Denny Villano shares a collection of experiences that will help uplift and invigorate even the most downtrodden. When the Lord reveals Himself, people experience many different things, but all will be forever changed. “A Light In The Attic” is the creation of published author, Denny Villano. Denny Villano lives in the beautiful coastal city of Mobile, Alabama with his wife and youngest son, Gabriel. He is a member of Christian Life Church and serves as a staff member, enjoying teaching, preaching, and leading various groups. Denny is also enrolled in his second year of ministerial studies with the Church of God School of Ministry and plans to fulfill God’s plan to dedicate his life to full-time ministry. His chosen profession as a self-employed carpenter allows him to share God’s love with many different people. He enjoys fishing, hunting, and playing golf. One of Denny’s most outstanding attributes is his immeasurable heart for the lost, the hurting, and the forgotten. As a first-time author, Denny is excited to share his supernatural experiences with an extraordinary God while maintaining a somewhat ordinary life. Published by Christian Faith Publishing, Denny Villano’s new book is a collection of true stories for those who need uplifted. “A Light In The Attic” recounts a series of spiritual encounters for those who are down and broken. As readers journey through one story after another, they will experience many different aspects of life. The experiences may help change how readers feel. They may change how they think. They may offer readers the peace and joy they seek as well as the full body healing they need. When God reveals Himself, people are affected in many different ways, but all people are changed when the Lord presents Himself. The stories within “A Light In The Attic” shares the spiritual experiences of one man who has been changed by his encounters with the Holy Spirit. View a synopsis of “A Light In The Attic” on YouTube. 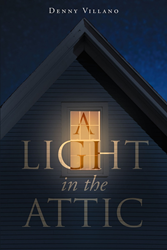 Consumers can purchase “A Light In The Attic” at traditional brick & mortar bookstores, or online at Amazon.com, Apple iTunes store, Kobo or Barnes and Noble. For additional information or inquiries about “A Light In The Attic”, contact the Christian Faith Publishing media department at 866-554-0919.